Hi, it’s Katie and Charlie with Abella’s Braids! 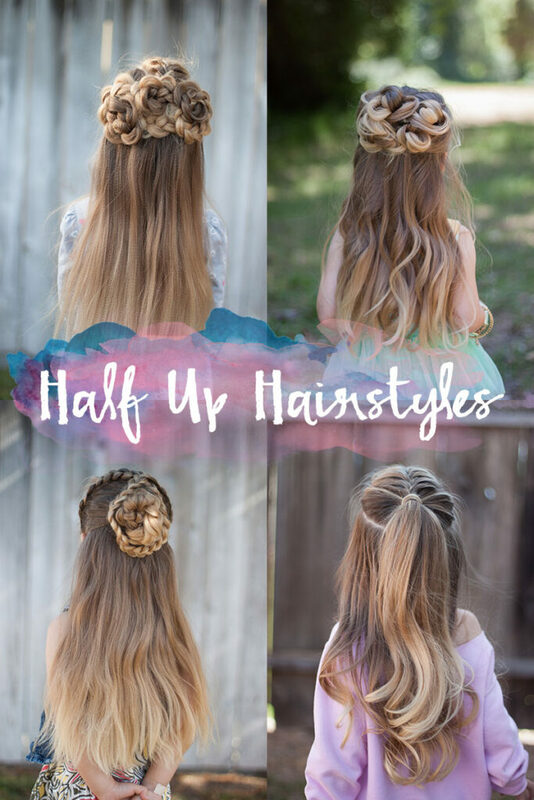 We had a lot of fun coming up with some fun, playful half up hairstyles for you for this season! We love that when you wear your hair half up, you can show off your length but still wear a beautiful and elegant braid/style! For some of these braids, we used our micro crimper. Micro crimpers are a great way to add lots of volume and texture and lengthen the amount of time between washings. If you want bigger braids, a micro crimper is great to have! 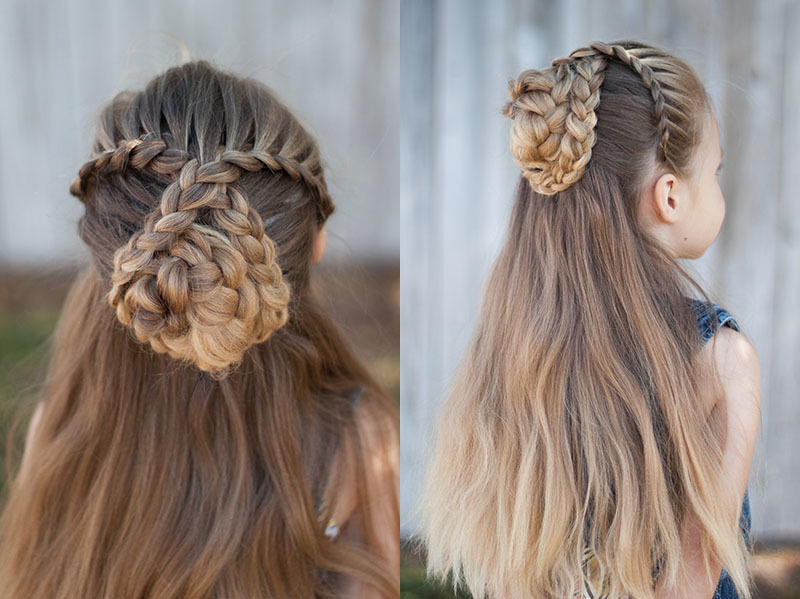 You can still achieve more volume by pancaking your braid, though, so tools definitely aren’t a must! 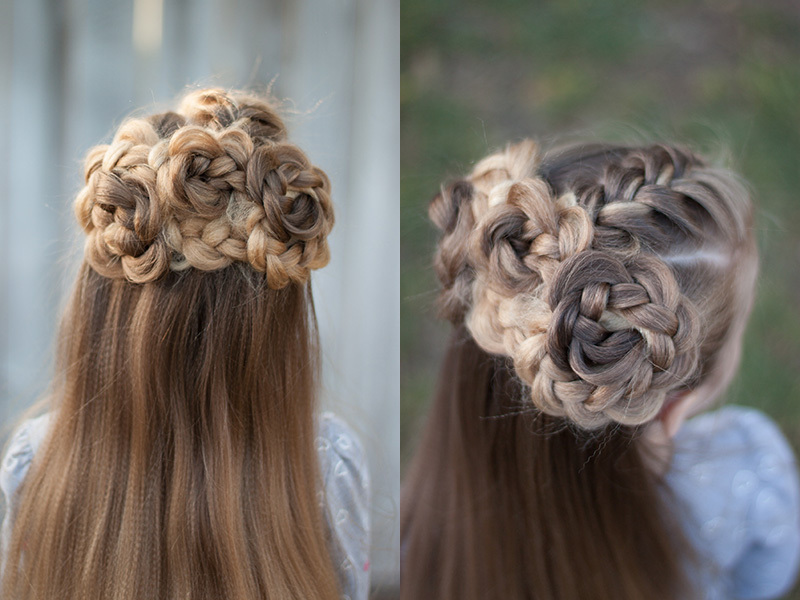 I think I’ve said it before, but I just LOVE flower braids! They are so simple but they look stunning! Take the top section out and section it into three. The middle section is a triangle, with the point in the back. French braid this middle section and braid all the way to the ends. 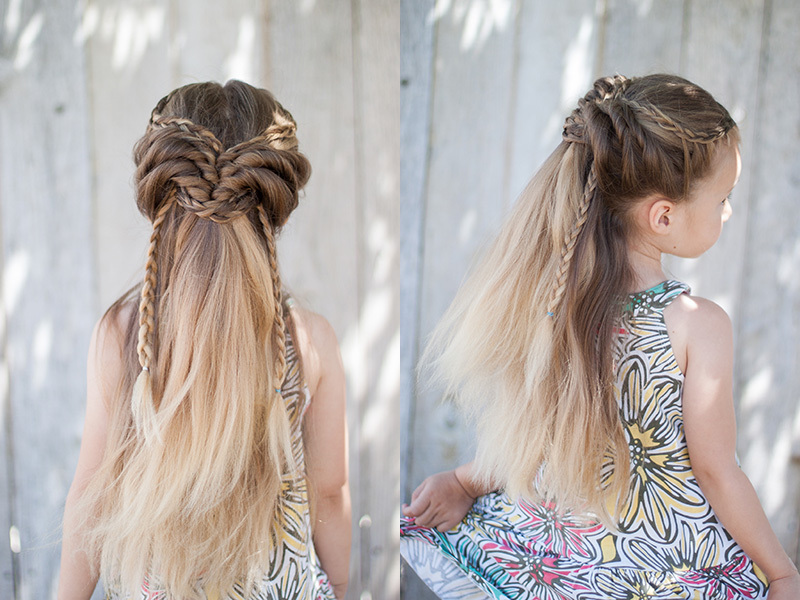 Pancake out one side of the braid tail as you go. The other two sections are put into ponytails, as close to the center as possible. 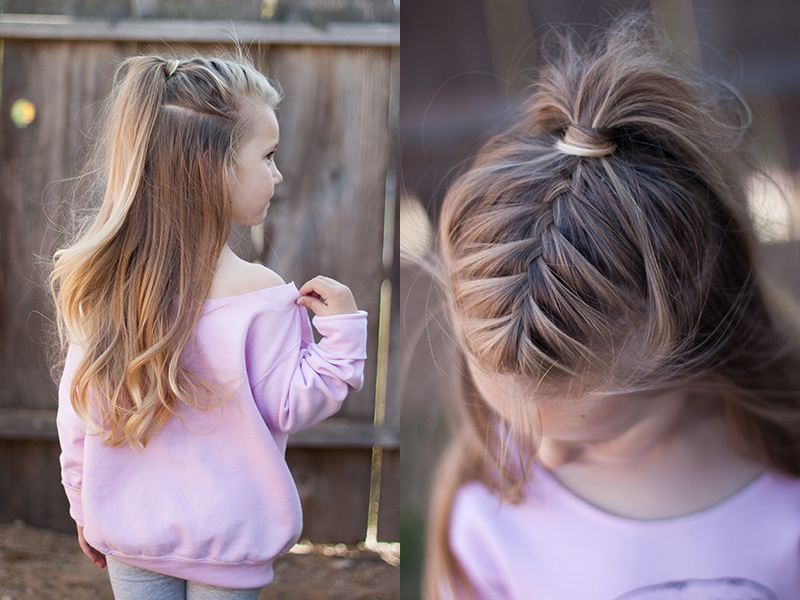 Braid both ponytails to the ends and pancake out one side. Roll each braid up into a flower and pin down. This half up style is simply knots! The texture helps with the volume here a lot but we also added some curls with our largest curling iron for more texture. I adore the way this shows off her natural ombre so much! I try to tell her to appreciate it while she has it, but I don’t think she understands. Haha! 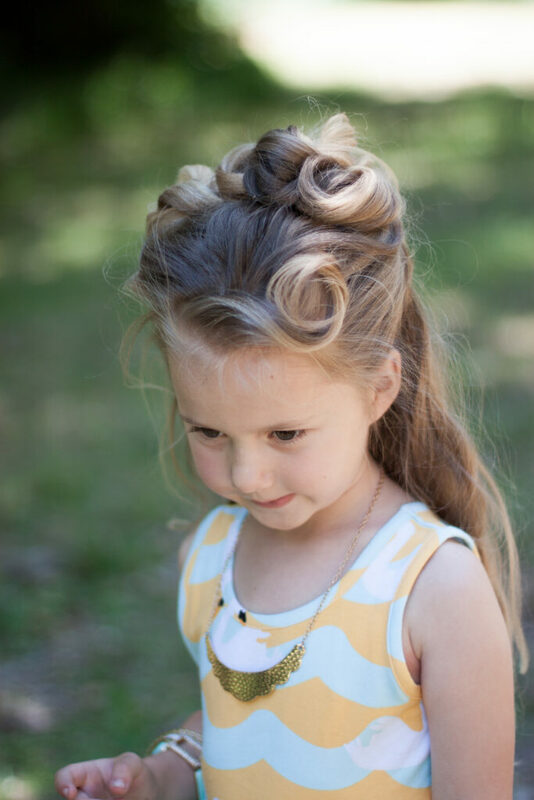 To create this style, take a chunk of hair, tie it in a loose knot and pin it down. 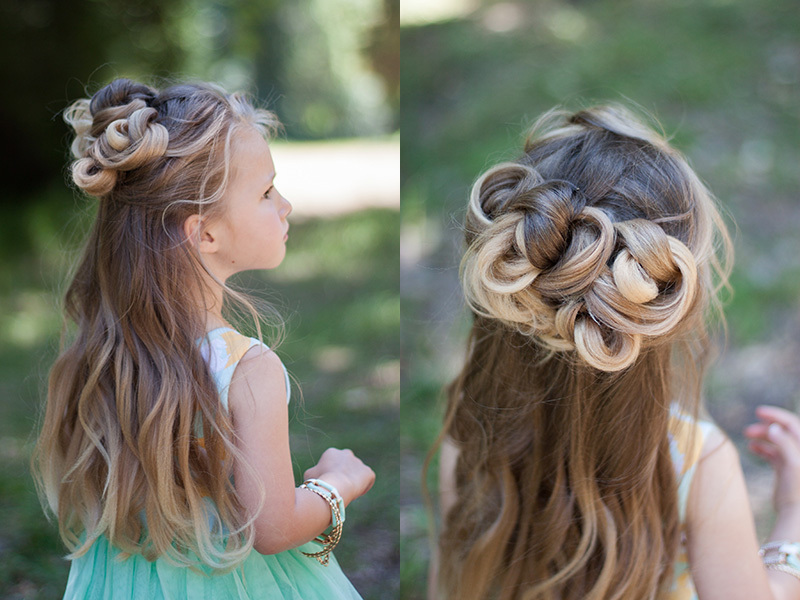 Repeat this all over the top, keeping the knots in a group in the back on top and you’re satisfied with the look. You can let some of the curled ends hang down a little if you’d like! Charlie and I went shopping after doing this style and we got stopped so many times by people wanting me to explain how I did it! Start by taking a section from ear to ear (where a headband would sit). Part it down the middle. Braid up starting at the hear until you reach the middle. Continue braiding through the ends. Repeat on the other side. The trick here is that I French braided starting in the middle right under the headband braids, down to about her ear. I braided through to the ends, pancaked it, and made a bun with it. Then I crossed the top to braids and wrapped them around the bun and pinned it down! By far my favorite trend right now is the half up high ponytail. Of course, I couldn’t help but add a braid to it! I started out with a large curls for volume and texture. I took a section from the top, middle and did a French braid. Tug on each section the braid gently to loosen it a little. Put an elastic to hold it in place where you want the ponytail to sit. Then I took a section all the way around the sides and back of the braid and pulled it together with the ponytail I made. I pulled out some strands to make the style look a little messy and carefree. I also wrapped hair around the elastic to polish the look. Make sure to leave hair out above the ears on the sides for the best results and the ponytail should be nice and high on the head. I also back combed the hair on the top of the ponytail for more volume!